What proportion of the market is aware of your firm’s brand? What issues are prompting buyers to seek external help? How does your firm’s client service stack up against competitors? What investment in technology and innovation do buyers expect from professional firms? Business Buyers Baromter (BBB) provides professional firms and B2B organisations with robust data about their clients and markets. It is the UK’s leading independent source of insight about the trends influencing buyers of professional services. Professional firms are invited to subscribe to the Business Buyers Barometer each year to gain access to exclusive insight and detailed analysis that will help inform their marketing and BD strategies, and measure the performance of their firm against competitors. Meridian West’s advanced market segmentation techniques will help your firm understand where to priorities marketing and BD resource, and to spot new opportunities for your firm to win work. 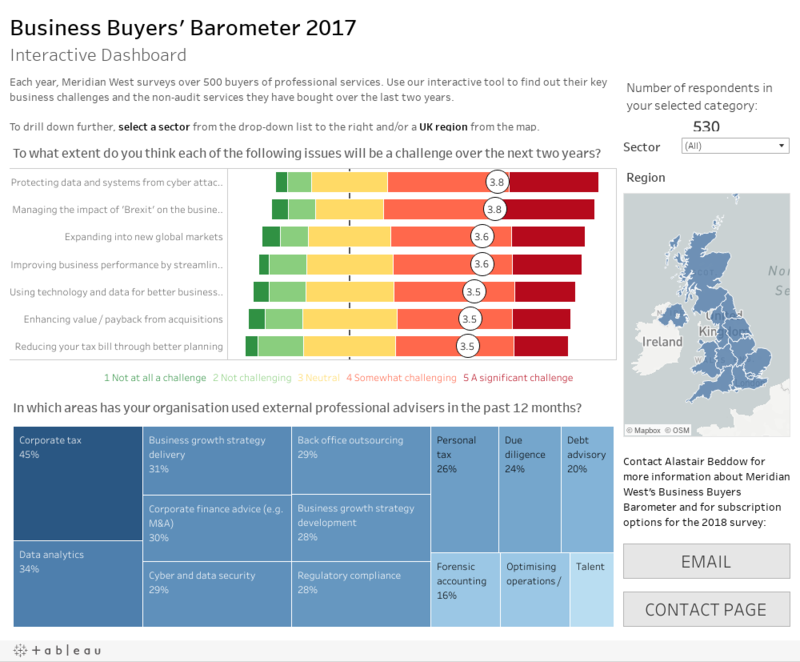 Business Buyers Barometer data and insight is available to professional firms in a range of subscription packages. Research report – a comprehensive write-up of key findings from the latest Meridian West research. Tableau dashboard and self-service analytics – ability to interrogate the data at your leisure and run your own reports using Tableau. Advanced analytics and market segmentation – access to Meridian West’s advanced market segmentation using cluster analysis and financial analytics. Bespoke benchmarks and workshop – tailor-made presentation to your stakeholder team including benchmarks for your firm, plus detailed implications and recommendations from Meridian West. Strategy planning – an interactive workshop with your stakeholder team using data from Business Buyers Barometer and other Meridian West proprietary data sources to share your future strategy. Partner conference material – content can be packaged into a ‘state of the nation’ presentation for a partner conference, including optional facilitated breakout sessions.